I have a new obsession. Microbatches. Well, it’s not all that new, really. I’ve just normalized it around these parts. 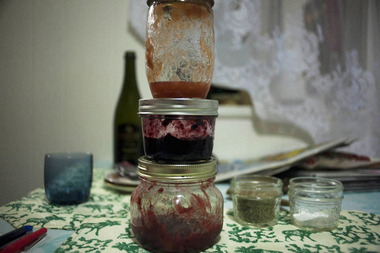 Microbatch (n): any canning/preserving exploit that produces a 1-pint jar or less. The flexibility afforded by microbatches is great. You can experiment with flavors and not feel like you’re putting a whole flat of (expensive) berries at stake by trying out something new. I’m an experimenter at heart, which is why I finally started a canning/kitchen journal to keep track of all my experimentation and exploits. You can put up a portion of the little boxes of gorgeous fruit that came in your CSA or whatever you could carry home in your purse from the market. With money on the brain and “…erries” as our monthly ingredient, a free pound of sweet cherries from Whole Foods—the coupon said “Free Cherries at their Peak!”—was a match made in heaven. Method: Combine all ingredients except basil in your heaviest-bottomed pot, cook over medium heat at low boil for ~10 min. Reduce heat to med-low and cook cherries for 15 more minutes. Watch the cherries and don’t over-cook them; you don’t want them to be puckered and wrinkled. Add basil to the pot for the last 2 minutes. I slivered mine (since I had such luck with slivered basil last year in blueberries). Add your basil sooner if your cherries start to wrinkle. You can also strain out the cherries and cook the syrup down some more. I didn’t do this because I wanted a lighter syrup. Process in the waterbath for 15 min. No need to sterilize the jar(s) in advance because your processing time is higher than 10 min. We enjoyed most of the fridge jar; I spread the remainder atop a cream cheese icing on a gluten-free shortcake for Cathy’s new blog launch lunch. Yesterday I gifted the lone sealed jar to Kat because she showed me how to sew a button onto my shirt in a more organized fashion (than my current, flailing, frantic approach). These would also do wonderfully dolloped on ice cream or spread thin across a cheesecake. 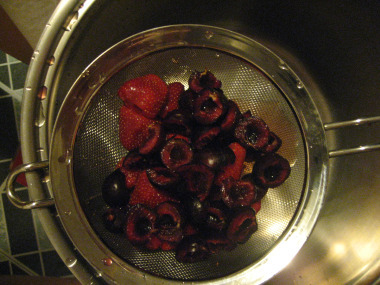 Method: Combine strawberries and sweet cherries with sugar and let macerate (sit covered at room temp) for an hour or two. 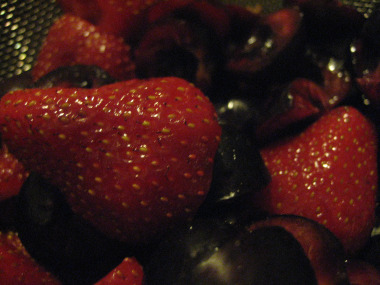 Weight and proportions of the berries are flexible, so long as you have a pound of fruit. Add lemon juice and cook berries over medium-high heat until mixture boils. Reduce heat to med-low and cook for about 12-15 minutes. Look for the big, dark bubbles to tell you it’s reached a gel or light set. Process jar for 10 minutes in boiling waterbath. I’m calling it preserves because mine ended up rather syrupy, which didn’t stop me from gobbling up the fridge jar within a day or two. I have one sealed quarter-pint jar left for the return of the sweet things giveaway series.